Backruns - the enemy of the flat wash! I've been working on an 18" x 18" crocus painting this week. It's actually my second attempt as I turned my back on the first one and came back to a giant watermark in the smooth wash of my sky. This version is better anyhow as I've worked on being in less of a hurry to apply paint, do a little more thinking. It's still getting darker than I had intended but I think that will be okay. Right now I am just waiting for my first wash of stem and leaves to dry. 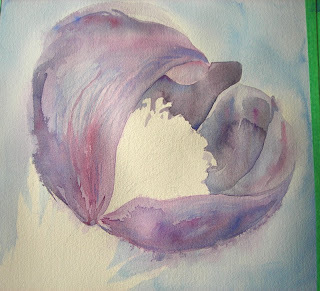 It's been a challenge for me to paint the fuzziness of the crocus, as the wild crocus is covered with fine silvery down on petals, stem and leaves. I want to convey that impression without painting every hair, as well as distinguishing between the petals with a mixture of hard and soft edges. 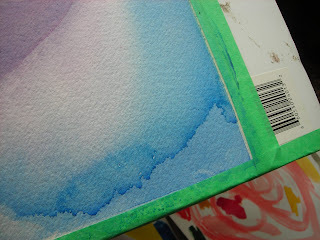 I love painting edges - laying down a crisp line of paint and then softening parts of it with water while leaving other parts "hard" or starkly defined. I think this is why I have never been able to get my mind around acrylic and oil painting - it lacks that fluidity that I have embraced in watercolor. When I read of an oil painter's freedom to make dramatic corrections even at late stages of their painting, I start to envy them this, but when it comes down to it, I wouldn't sacrifice the wonderful qualities of watercolor to gain that flexibility. There is something so anticipatory about dripping colours onto a wet wash and seeing the resulting blend - different every time. Even my palette dries into beautiful marbled patterns!